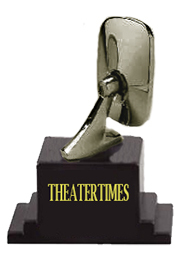 Though attendance was down, the rewards for theatergoing in 2013 were up and that is primarily due to being in the right place for good writing. And, the work leaned towards the new, with world premieres by David Henry Hwang and Samuel D. Hunter, and relatively recent work by Gina Gionfriddo, Stephen Adly Gurgis, and Joanna Murray-Smith. I was in lonely company liking Murray-Smith's Gift. The 24 area theater critics worthy of Bitter-Lemons rankings averaged a 55% Bitter rating. This outsider found that the play's "healthy mix of similarities and differences have the couples seeing reflections and inversions of themselves in each other, and the attraction of opposites quickly takes hold." That, rather than a melodramatic plot and often windy philosophizing, was what made this intriguing. The Geffen produced the American premiere of The Gift, as it had Murray-Smith's earlier, more popular, but for me less interesting Female of the Species and it was also the site for Gionfriddo's Rapture, Blister, Burn, which I also found to be "an engaging comedy of ideas." It was also an opportunity to reconnect with the production's lead, Amy Brenneman, who phoned in an update to her earlier interview during one of her commutes to the theater. And, leave it to Antaeus Theatre Company to field a pair of alternating casts that both demanded attention. Only managed to see one, which had Anne Gee Byrd, making the most of a great part for a woman of years, as Mrs. Warren and Rebecca Mozo as her daughter. Robin Larsen did the directing and the production earned its share of nods and noms at year's end.